Well, as you can see, I had a bit of an OOPS while exercising yesterday. I was on day 6 of P90X, KenpoX day (kickboxing). I got a bit carried away with all the punches, and during one of the combination punch exercises, I threw an uppercut and punched myself in the eye. Ouch. I felt pain immediately, but kept exercising. Once the hour was over, I joined my husband and son outside and both looked at me and said, "WHAT did you DO?" I hadn't checked a mirror yet. I explained what happened and both found my misguided punch hilarious. Hubby said, "You are going to have one heck of a shiner." I figured I'd better take a look. The above photo was taken an hour after I punched myself. Today, my face under the eye is quite swollen and tender, and yes, I DO have a horrid black eye. My first. LOL I'm sorry but I think this is fabulous! You are a girl going for it! That's quite shiner! Funny story though. 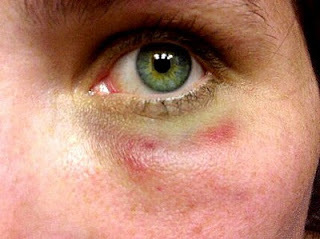 It's not often that one gives themselves a black eye like that.